Over two million pets and other live animals are transported by air every year in the United States. If you fly on commercial flights regularly, chances are that you’ve seen a service dog at a traveler’s feet or a pet in a dog kennel under a seat. 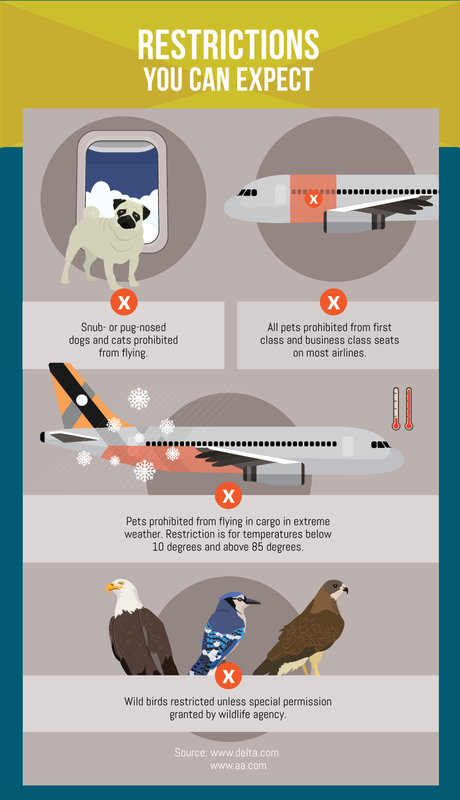 If you are considering flying with your pet, you need to know that airlines as well as federal and state governments impose restrictions on transporting live animals. Before buying Fido a ticket, research whether your airline and destination are conducive to pet travel.How to Prepare For Flying With Your PetYou can transport your pet in one of three ways on most airlines: in the airplane cabin (if you have a small pet), as checked luggage, or as cargo. In general, large pets, such as large-breed dogs, will need to travel in the cargo hold, whereas lap dogs and other small pets can travel in the cabin. Either way, your journey with your pet will start long before takeoff.Before flying with any pet, you’ll need to check animal transport policies on your airline’s website. Before purchasing tickets, check the following:Your pet is eligible to fly (age, health, and size are factors).The temperature will be within a safe range for pets if flying them in cargo.Your aircraft and destination allows pets.Some destinations do not allow cargo-based pet travel (such as extremely cold or tropical locations), and pets are not allowed in some aircraft cabins at all. Do your research before booking. Once you’re set to travel with your pet, you’ll want to download your airline’s animal travel form (each airline has its own form), which you’ll need your veterinarian to fill out for you. For domestic travel, vet records and vaccination records are not always necessary, but they’re useful to have on hand. You’ll also need to purchase an airline-approved travel kennel for your pet if you don’t already own one. For cargo pets, the kennel must be made of rigid material (no cardboard or wire mesh), have a leak-proof bottom, be ventilated, and be large enough to allow your pet to stand, turn around, and lie down. For cabin pets, the carrier can be hard or soft-sided, but it must be ventilated and it must fit under the seat in front of you. If you’re flying with a service animal or emotional support animal, be prepared with documentation. Service animals must have documentation, and emotional support animals must be accompanied by a note from a mental health or medical professional. On the day of your travel, allow extra time at check-in, but be sure not to arrive too early; pets cannot be checked in more than four hours before a flight. Make sure you offer your pet food and water the day of your flight, and don’t medicate your pet unless specifically instructed to do so by your vet. Medications such as tranquilizers can have unexpected complications at high altitudes. When going through airport security with a cabin pet, take your pet out of the kennel and be prepared to contain or control him or her with a leash while going through security. The kennel will go through the X-ray machine, and you and your pet will go through the metal detector machine. At the gate, you must keep your cabin pet in his or her carrier or kennel at all times. At the other end of your journey, checked pets will await you at baggage claim; ask personnel on the ground where to greet your animal. If your flight is not direct, note that checked pets will only be transferred on your set itinerary through select cities, which vary by airline. Do your research! Ideally, fly direct. Pets flying with you in the cabin are most likely to have a safe, comfortable flight, but if you need to fly your pet in the cargo hold, there are few things to know. Pets checked as luggage or as cargo fly in a pressurized, lighted, temperature-controlled section of the cargo bay, but this section is NOT pressurized and controlled until take off. If there’s a long delay on the ground, you’ll want to notify flight attendants. 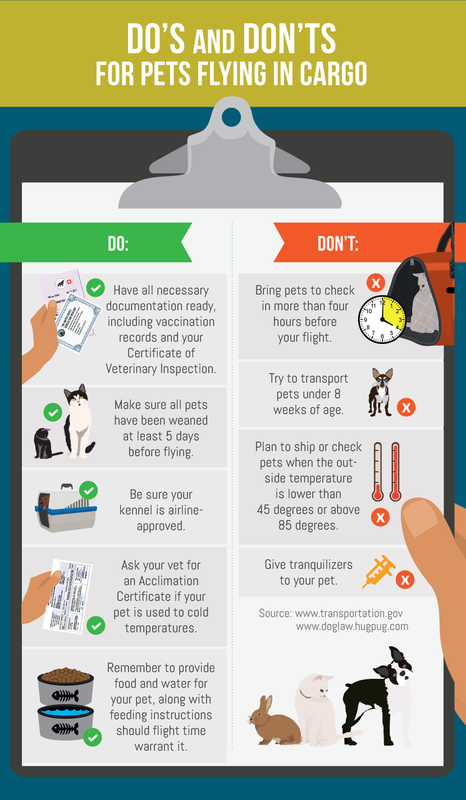 You’ll also want to go over any stopover plans when you check your pet. When transported to a second plane, you don’t want your pet left outside for any length of time in hot or cold weather. Keep in mind that pets flying as luggage can sometimes be treated as such; you can help by ensuring that there’s a large “live animal” sticker on his or her kennel and that food and water is visible on the outside of the enclosure. In short, you’ll need to be your pet’s advocate during your flying day, which includes speaking up in the case of delays or extreme weather. If you’re flying with a service animal or emotional support animal, your animal will fly free and will remain with you in the cabin as long as he or she can fit at your feet or under the seat in front of you. Large service animals will still need to fly cargo to ensure access to emergency exits for other passengers. 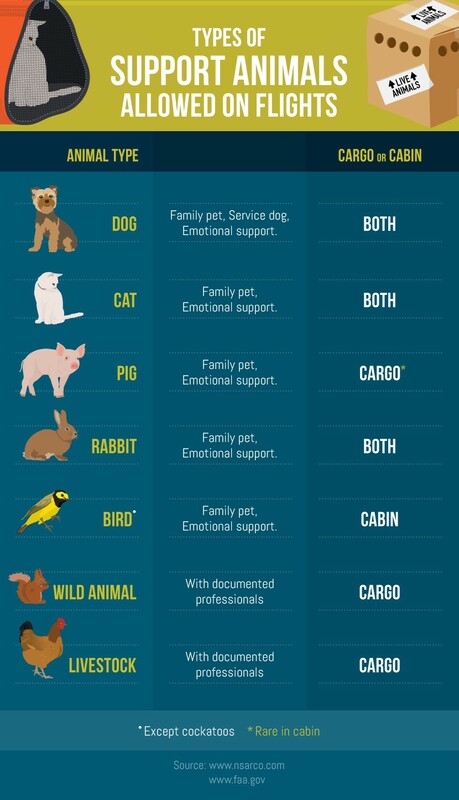 Wondering if you and your pet qualify for emotional support? You’ll need to provide documentation of an emotional or psychological disability, and your pet will need to pass the NSAR Public Access Test, which essentially ensures that he or she can behave in public. If you’re flying with a service or support animal, your animal travels with you free of charge. For family pets, the fees vary by airline (just as they tend to do for humans! ), but in general, families can expect to pay over $100 per animal flying in the cabin and around $200 per animal in cargo or checked luggage. Remember, you’ll also need to budget the cost of your approved pet kennel, any vet visits necessary to produce documentation, and any food, water, and medication needed for your pet while traveling. Most animal health experts agree that Fido is usually better off staying at home with a pet caregiver or in a boarding kennel during short family holidays since traveling by air can be stressful and risky for any animal. However, when the family pet needs to come along, the tips above will help ensure smooth skies for everyone.